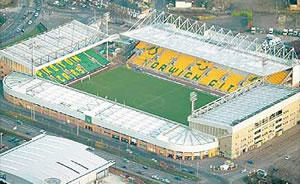 Carrow road now holds around 27,000 fans following the addition of some 1700 seats for the start of the 2010/2011 campaign. Visiting supporters are usually allocated around 2,500 seats in the Jarrold stand (South stand), which is the newest stand. The facilities available to away fans are good, with unrestricted views, good food, snacks and refreshments, and a friendly atmosphere. The other three stands were all built during the late eighties & early nineties when Norwich were in the old division one and the inaugural premier league. The Barclay and the Snake Pit, seen to the far left on the picture, house the vocal home fans, and their close proximity to the away fans creates a good atmosphere. At the opposite end to the Barclay stand is the Norwich and Peterborough stand (river end). This stand is home fans only, and contains executive boxes, and conference facilities, and a disabled viewing gallery. At the corner of the River end, and main stand (bottom right of the photo) you will find the club shop, and a restaurant called 'Yellows' (see Pubs). Travel around the Norwich South bypass (A47), to the A146 Trowse exit and ground is well signposted from here. If you arrive early, and fancy seeing some of the City, then travel to the east side of Norwich, the exit the A47 at the A1042, Norwich North /East Exit (Broadland Business Park). Following the signs for Norwich, go straight over the next two roundabouts, past The Griffin public house. At the next roundabout, take the first exit into Yarmouth Road, past the Thorpe Fish & Chip shop, and through two sets of traffic lights. At this point you will be travelling alongside the River Wensum, and past several pubs, but you are still a distance from the ground. Once you get to the Harvey Lane traffic lights, there is some none resident parking available, and there is also a large car park in the Breckland Council building. From here the ground is about a 20 minute walk. Continue straight on into the city, past the The Mustard Pot, and over the railway bridge. You will be able to see the ground now, and the away fans are located in the first corner of the ground you come to, behind the Holiday Inn Hotel. The ground is approximately a ten minute walk from the station. When you arrive at the train station, you are fortunate for two reasons... One you are not far from the ground, and two, the walk will take you through a recently redeveloped part of Norwich which contains bars, fast food etc...Enjoy! On exiting the train station, walk along 'Riverside Road' (this is hard to miss as it's by the river!). The ground is at the end of this road, You can't miss it (really!). There is a large car park at the ground, but this is for season ticket holders only. The closest pay & display is located in Rouen Road, and holds about 500 cars. The town centre is only about a 15 minute walk from the ground, and there are numerous well signposted car parks. If you follow the official directions (via the Trowse exit on the A47 Southern bypass) then you are probably best parking in the County Hall car park. This is well signposted, holds approx. 2000 cars, and will cost you £3. That said, it is a bit of a nightmare to get out of after the game. If you follow the directions on this site, then there is some non- restricted back street parking near the Mustard Pot, but be careful to avoid the 'residents only' signs! To park in these back streets, you really need to be parking about an hour and a half before kickoff. This is a popular choice with away fans, if you're travelling by train you can't miss it as it's directly in front of the train station (just over the river). This is a big pub featuring a large balcony overlooking the river, and it's usually full of away support on match days (since the Clarence Harbour closed). There's a good selection of beers and good food, and it's about a fifteen minute walk (at most) to the ground. Please note: There is a KFC just a few doors down, so you can easily grab something to eat and walk to the ground. This is a great football pub, but is mainly used by home fans. There are two large screen TV, that show 'memorable' Norwich games, and several smaller TV's with Sky Sports on. The ale is good, but expect to wait to get served, due to the sheer size and popularity of this pub. You may find the service is quicker upstairs, at one on the smaller bars. There is also a large riverside balcony, which we are told hosts barbecue's during the fair weather games. This pub is well worth a look, but if you are in a large group, then the doormen may not be too welcoming! This pub is located at the ground within the Riverend, and lets in a 'limited number' of away fans. It includes a large screen TV & a 'McDonalds' style burger bar, but obviously gets rather crowded on match days. For away fans the location is also a bit of a pain, as it's located in the opposite corner to the away end! The Coach and Horses is located on Thorpe Road, which is very near to the railway station, 10 minutes from the city centre, and 15 minutes from Carrow Road. This pub boasts it’s own brewery (Chalk Hill Brewery) and hence serves many real ale beverages. A word of warning, this pub gets very busy, so arrive early! Located on Thorpe Road, this pub contains mainly home supporters, but the occasional group of away fans are treated with respects, and occasionally a little banter. The beer available is best described as 'OK', and it's about a 15 /20 minute walk to the ground from here. There is also good, 'down-to-earth' food served, although to eat in this pub you really need to be early, as it does get busy. If you have travelled by train, then this is probably the easiest place to get something to eat. On exiting the station, go straight over the traffic lights, (over the bridge) into 'Prince of Wales Road'. The Kentucky is about 150 yards down on the right. Morrisons Supermarket is located just across the road from Carrow Road, and is very popular for pre-match grub. Holiday Inn Norwich City is located within one of the corners of the football ground, with some rooms offering views of the pitch. There is a large bar, good food, and an excellent location as it's very close to the train station, and Riverside Complex. If you are a registered user then you can login, and create your own personal review of Norwich City Football Club - Carrow Road. These reviews can be private or public.